It has been an eerily quiet year on the white shark scene in False Bay, both in the summer months inshore, and over winter at Seal Island. During the 2017/18 summer season, Shark Spotters recorded an all-time low number of white shark sightings across the eight beaches they operate on in Cape Town, but saw a surprising increase in the number of bronze whaler sharks frequenting the inshore zone over this period. At the island, the arrival of white sharks was uncharacteristically late this year, and activity has remained low throughout the winter season. 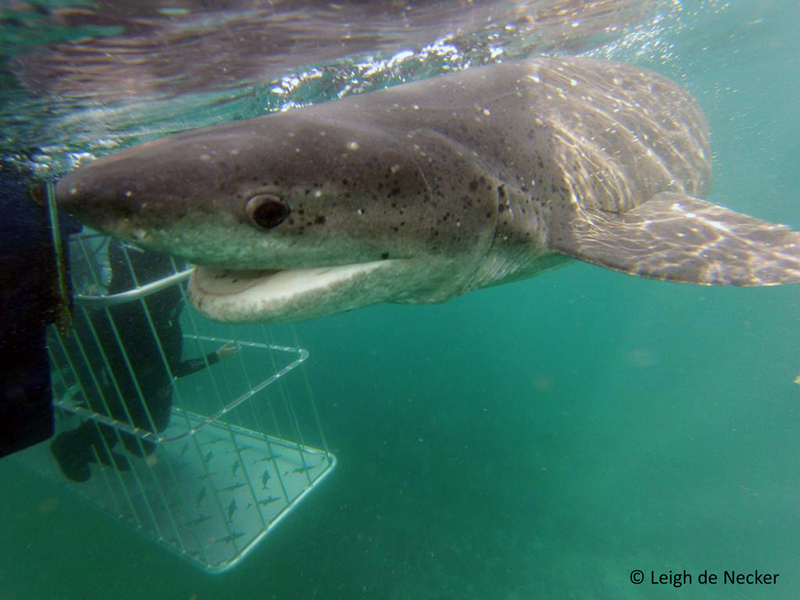 Intriguingly, the reduced presence of white sharks at Seal Island seems to have opened up a niche that has quickly been seized by sevengill cowsharks, and for the first time in False Bay history, cage diving charters are advertising “Cowshark cage dives!” at Seal Island. When one looks at the big picture, it most certainly begs the question: what is going on in False Bay? In order to answer this question we must first step back a few years to when there was a more stable pattern in white shark presence within the bay. Of course nothing in the ocean is ever truly stable, and there are countless unseen processes that work over a broad range of scales and have impacts that are difficult to predict. However, white sharks have been a common sight and fundamental part of the False Bay ecosystem for as far back as anyone can remember. So let us begin with the status quo of the shark hierarchy within the bay over the past decade. As top dogs, white sharks were never particularly worried about competition or predation from other shark species, so their movements in the bay were largely driven by prey availability. To paint the picture more clearly, we can label white sharks as the “lions” of the False Bay ecosystem, perched at the top of the food chain, following the juiciest prey without worry of competition. During winter, when young of the year, freshly weaned and oh-so-ignorant seal pups leave the safety of Seal Island and hop into the sea for the first time, white sharks are known to aggregate in the waters around the island to take advantage of these easy pickings. As the seals get older and wiser in the summer months, white sharks move inshore to take advantage of easier prey – seasonal shoals of fish such as yellowtail. This resulted in the year round presence of white sharks in False Bay, but different movement patterns between seasons. So where did this leave our slightly smaller shark species such as the sevengill cowsharks and bronze whalers? We shall call these species the “leopards” of our landscape. Much smaller and thus used to being at a competitive disadvantage to our “lions”, these wily middle-order predators adapted strategies to avoid competition and possible predation from the big guns at the top of the food chain. This is critical as species such as sevengills are known to exploit many of the same prey species as white sharks, including seals. So instead of going head to head with white sharks, sevengills adapted a wide suite of tactics to avoid unnecessary conflict, including differences in predatory behaviour over both space and time. Sevengills were thus known to stay on the periphery, seeking refuge in a sheltered kelp forest off Miller’s Point by day, and using the advantage of depth and darkness to venture out to hunt at night. While less is known about bronze whaler behaviour in False Bay, these sharks appear to have only a seasonal presence in the summer months in False Bay. Although their presence in the inshore zone at this time of year coincides with that of white sharks, any shark spotter will tell you that bronzies give white sharks a wide berth when making use of the inshore zone to predate on baitfish in the summer months. And so the balance has been maintained between these species, with the white sharks running the show, and the sevengills and bronzies prowling the periphery. But if you have a look at Figure 1 below, you will notice that the last six years have yielded a downward trend in the number of white sharks recorded by Shark Spotters in the inshore zone of False Bay. This trend has also been observed at Seal Island, where the famous “Flying sharks” of False Bay have been increasingly scarce, leaving their worldwide fan base disappointed for multiple seasons. As you can see from the earlier years in Figure 1, white shark presence on the inshore of False Bay is known to fluctuate notably across consecutive years. However, never before has there been such a long period of consistently low activity at both Seal Island and along the inshore. The burning question on everyone’s mind is of course: “Where are the white sharks?? ?” Unfortunately, the answer to this question is still under debate, with fingers being pointed at a range of potential culprits – from fishermen, to orcas, to changing environmental conditions. In reality it is likely a combination of factors that have interacted to create this current shift in the status quo. It is also uncertain how long this lull in activity will last. 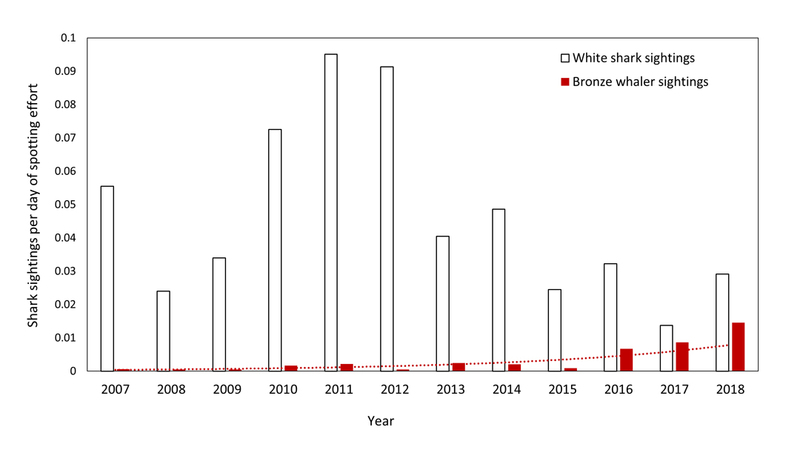 Previously, the notable dip in white shark presence recorded by Shark Spotters in the inshore zone in 2008/2009 was followed by a massive increase in presence in 2010 – 2012 (Figure 1). 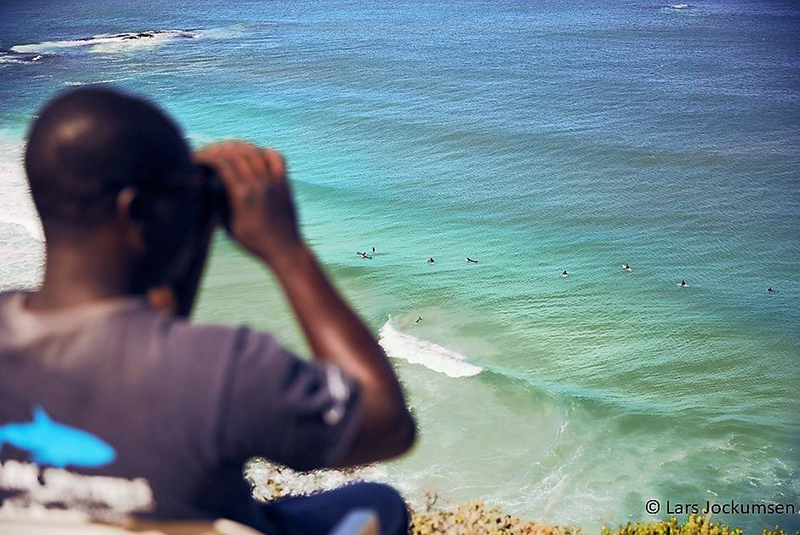 Therefore, water users are encouraged to remain risk-averse, and Shark Spotters are staying on their toes in anticipation of once again seeing those all-too-familiar shadows off the backline at Muizenberg beach. Number of shark sightings per day of spotting effort across all Shark Spotters beaches in Cape Town over the period from 2007 - 2018. But what is truly fascinating about this lull in white shark activity is what is unfolding in False Bay now that the “lions” have left the proverbial pride-lands. The decline in authoritative white shark presence has presented new opportunities for our “leopard” species, which have been quick to fill the gaps left by white sharks within the bay. Hence, we have seen a sudden increase in the number of bronzies along the inshore during summer, while the cowsharks appear to have taken up residence at Seal Island, making the most of the lack of competition from white sharks. If you had told me a few years ago that adverts for “Cowshark cage dives” would be circulating on social media, I very likely would have fallen off my chair with laughter. It was simply inconceivable – and yet here we are. Furthermore, the well-known safe haven for sevengills, and popular dive site at Miller’s Point on the western border of False Bay, has been largely abandoned for the past year, perhaps due to the fact that the sevengills are now making hay while the sun shines at Seal Island. So now that this new order has been established, the final question is: what will happen next? Are cowshark cage dives to be the new norm in winter at Seal Island? Will the biggest threat to surfers on the inshore be bronzies in summer? Unfortunately, the reality is that we currently just don’t know enough to be able to predict what will happen next. The observed decrease in white shark presence in False Bay does not appear to be mirrored all along the South African coast, with certain areas on the south and east coast actually experiencing increased white shark activity lately. This is promising as it points to a regional distribution shift, rather than a country-wide population decline, which would have far worse repercussions for our coastal ecosystems. However, what has caused this shift remains unclear, and until further research can be conducted to pinpoint the cause, we are unable to predict if and when white sharks will return en masse to False Bay. In the meantime, our research team is continuing their efforts to understand the ever-changing dynamics of shark behaviour within the bay. Ongoing tagging of sevengills and white sharks is being conducted opportunistically at Seal Island and along the inshore of False Bay. Furthermore, we are hoping to add bronze whalers to the list of tagged species, in order to gain a better understanding of the intricate dynamics among these species within False Bay and more broadly along the South African coast. It is hoped that through ongoing research, environmental monitoring and collaboration with other researchers, we can gain a better understanding of what is driving these current changes, and what the future holds for the sharks of False Bay.